We just dropped Mr. Picky off at the bus to take him to sleepaway camp for two weeks. The goodbye was a tearful one. The tears were all mine and my husband’s, of course. He couldn’t wait to be on his own, playing sports all day long and eating kid cuisine to his heart’s content. I said the same thing to him that I said to the girls just before we left them on their own for two weeks. “I love you super much. Have the best time! Don’t drink any soda.” My husband looked at me like I was a fringe lunatic, which you all know I’m not. We’ve all got our own rules for how we eat. I have my personal 90/10 rule — 90% of the time I try to eat the very best I can, as close-to-the-source and nutritious as possible. 10% of the time I stray from the path, but I feel no guilt about it. My kids are not on this plan since I am not with them 90% of their day and who the heck knows what they’re eating when I am not around. I’m pretty realistic in the sense that if I deny them all sweets, processed food, junk, it will backfire on me and they will likely get sneaky about it. Let’s say they’re on a 66/34 plan. HOWEVER, I do have one strict food rule that I expect everyone to abide by — absolutely, positively NO SODA. I have given my kids and my husband a list of reasons why they should never poison themselves with this good-for-nothing liquid and I keep no soda in my house. At one point this caused an argument between my husband and me because he felt that we should have a few soft drinks just in case we have guests who would like one. Really? I wouldn’t serve soda to a dehydrated stray cat let alone someone that I care about. So far no one has complained (at least not to my face). The rule stays. So what do we drink in this house? Purified water, mostly. Mr. Picky also drinks raw milk. The girls and my husband make a lot of herbal iced tea and I drink green tea and tulsi tea. 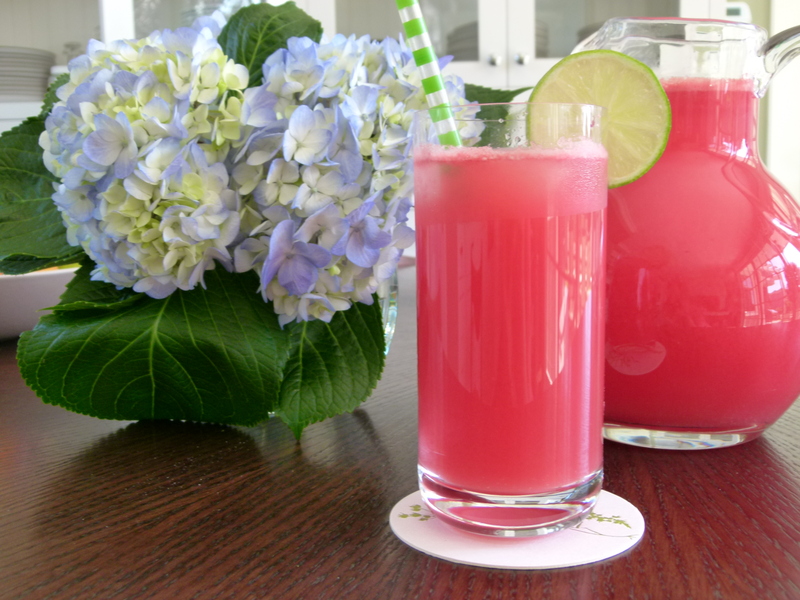 But in the summer when melons are in season, I love making agua frescas. 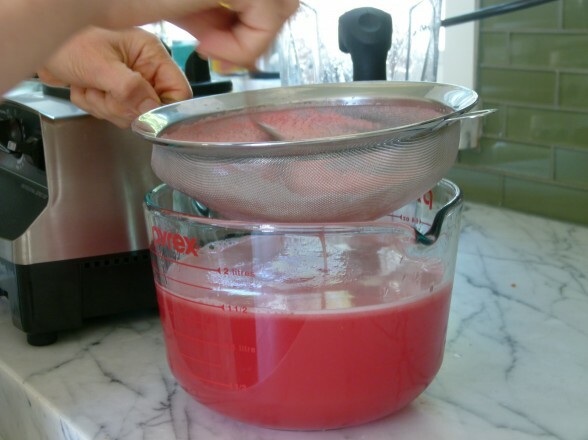 These are natural homemade fruit drinks, the same way lemonade comes from lemons, unless you use a scooper and powdered something-or-other and then you and I need to spend more time together. But unlike lemonade, agua frescas contain little to no sugar since you are starting with fruit that is sweet, like melons or berries. They are so refreshing on a hot day and are pretty as can be in a tall glass. Who needs soda? We had some friends over the other night and I made a few pitchers of watermelon agua fresca, one with mint and the other without. The kids were loving them, as were the adults and I never heard any queries for soda. However, I did notice two of the adults add a splash of vodka when they thought I wasn’t looking. My kids think of agua fresca as a “treat,” but it’s really just fruit blended with water with the occasional spoonful of raw honey or sugar added if the fruit wasn’t perfectly sweet. I have made cantaloupe and honeydew agua frescas, as well as watermelon blended with strawberries which is absolutely terrific. You know when you get a melon that’s a little mealy, but still has good flavor? Instead of throwing it away, use it in an agua fresca. If your kids are hooked on soda, maybe try this agua fresca recipe, but cut the water in half and add sparkling water to the strained mixture. Baby steps, people! 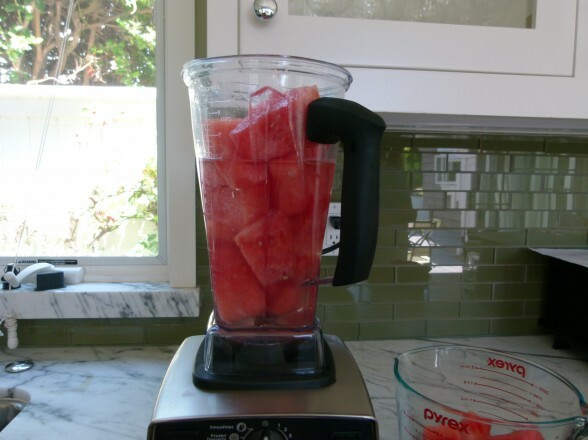 Place half the fruit and half the water in a blender and puree until smooth. Taste for sweetness. If you think you will need to add sugar, add it in the next batch. Strain the liquid through a fine mesh sieve into a pitcher or a large bowl. Repeat with the remaining fruit and water, adding the mint leaves if you are using them and sugar. Blend until smooth. Strain. Stir in lime juice. Chill until ready to serve. Your link for the reasons not to drink sodas is broken. I’d love to send to my kids! With a vitamix, I just leave the seeds in. My understanding is they are loaded with protein, vitamin b, magnesium, antioxidants, calcium, iron and other good stuff. I’ve also been enjoying melon (honeydew or cantaloupe) with a little bit of vanilla. 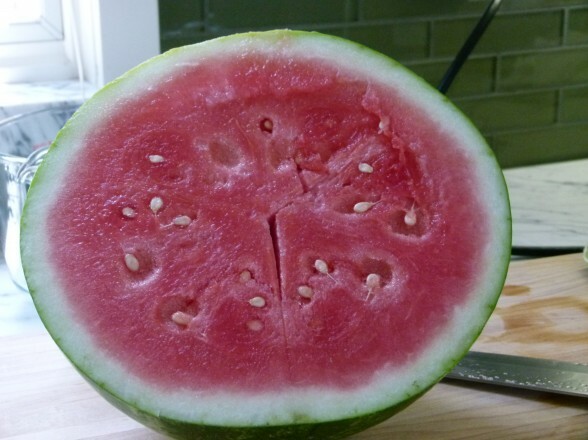 Gotta love melons in the summer for cleansing/detox. Thanks for the post. 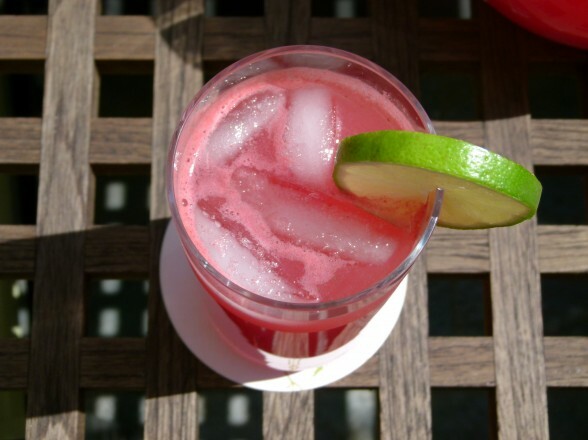 What an easy and delicious drink to make! The kids loved it – I am thrilled when they enjoy what is healthy and good for them. They wanted to do more experimenting so we did one with peaches. I did a drink last week with Prosecco, juice from oranges, and pomegranate juice for the adults at a get together last week that was great as well. But, I am so happy to learn of a fast, healthy, and delicious way to make drinks my kids enjoy! Thanks, Pamela! I am just thrilled to pieces that you got the kids involved and they liked it! Good job and thanks for the cool adult drink ideas! I have to complement you on the appearance of your creations; the photographs are so enticing. Thank you not only for easy, and delicious recipes but for such appealing presentations as well. Off to buy some melons! Thank you, Mary. Lovely of you to say. Enjoy! I love the idea and do it frequently with pineapple when it’s on sale and I can’t eat it fast enough when it rippens. I cut it into chunks and either purée it in my VitaMix then freeze it (sorbet anyone?) or serve it as is sometimes not even adding water. Though I’ve madeca smoothie by adding a few frozen banana’s to the puréed pineapple with or without addtl liquid. I love watermelon too, even adding fresh or frozen berries and liquid stevia if addtl sweetener is needed (can’t have any sugars). I don’t strain mine at all because I figure the extra fiber is good for us, but imagine others would like it that way. I have some fresh rhubarb I think I’m going to cook and try making a beverage with. Thank you Pamela for the reminder, as I have a fresh watermelon on the counter now! Thanks for all the great tips, Marty! I haven’t thought about using pineapple before — why not? Have fun! This looks fantastic. Although I haven’t even tried the watermelon agua, will this work with berries or fruit combos or stone pit fruit? I like the idea of adding some sparkling water. For adults only, I assume a bit of vodka or gin or some Prosecco might add a special festive touch. I’m going to do some experimenting! 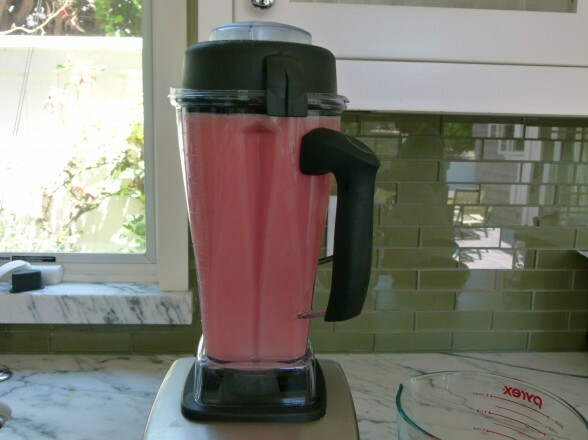 Yes, you can use whatever pitted fruit that can be blended with water and strained. Some fruit is sweeter than others, so taste and adjust your sweetener accordingly. I think the idea of adding some Prosecco is nice. If you add it to peach puree, that’s like a Bellini, right? Yes, as a matter of fact, it is a Bellini which is also made with Champagne but I absolutely prefer Prosecco. next time i get a bad watermelon which is usually every time i choose it instead of the person at trader joe’s I am going to make this recipe. hope you and the rest of the family are having a great summer. I have an easier time picking out good cantaloupes and honeydews over watermelons. But the texture of the melon won’t affect the drink, so definitely use what you’ve got. Love summer!! !